On Producing Shadows: "It was challenging, since it is tough to tell 50% of BLIND GUARDIAN what they should do, but it was all right at the end." SINBREED continues to make a name for themselves in a crowded field with their songwriting, musicianship and aggressive approach to melodic power metal. Guitarist and band founder Flo Laurin took some time to talk to KNAC.COM about their latest release, Shadows, and the past, present and future of SINBREED. Check it out! KNAC.COM: Tell us about your musical background and influences as a guitarist and composer. Were you in any recording projects prior to SINBREED? LAURIN: No, I haven’t been in any projects or bands prior to SINBREED. I always wanted to bring my “vision” of Heavy Metal Music to life and that's why I started the band.When I was very young, at around 13 or 14, there was only the goal to become a better guitarist. I very much listened to Malmsteen, Jason Becker and Vinnie Moore and I wanted to achieve their skills, haha. I quickly lerned that this for me is impossible and I started to focus more on songwriting and producer skills. I am obviously influenced by bands who feature two guitarists in their ranks and know how to use this feature, like JUDAS PRIEST and VICIOUS RUMORS. KNAC.COM: As the leader and driving force behind SINBREED, what are your musical vision and goals for the band? LAURIN: So far we do very well. We have grown as a band, especially with welcoming Marcus Siepen as a permanent member and splitting up songwriting to all heads. I still see “my” musical vision grow in addition the other guys bring in their ideas and it still is SINBREED. So for future goals I am aiming to continue releasing records and hopefully tour our country, Europe and the world. This nowadays is hard to achieve but it’s so worth trying. 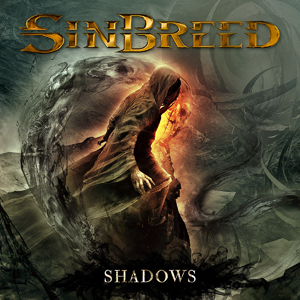 KNAC.COM: From my perspective, SINBREED came out of nowhere in 2010 with your debut CD, When Worlds Collide. Can you provide a brief history of SINBREED and how the lineup came together? LAURIN: The songs on When Worlds Collide were composed by myself during a timeframe of nearly 10 years. Once it was time to release those songs I started to seek for musicians who in my opinion would fit best. I knew Herbie from SEVENTH AVENUE and I met him once when I was a kid and I always wanted him to sing. I offered him the singer position, he luckily accepted so it was on me to form the band. Frederik and I grew up in the same town so we already knew each other and he joined right away. Very cool, since he already joined the mighty BLIND GUARDIAN. I knew Alex from the local scene, too, so the band was formed and still is together, plus Marcus. KNAC.COM: My introduction to SINBREED was through the “Dust To Dust” video, which remains a favorite. Can you describe the process of making this video and the team involved? We’d also like to hear similar details about the recent “Bleed” video. LAURIN: We are really proud of "Dust To Dust" since this was a project of the band with a very small team and budget. We were lucky to find a director and team, who were very VERY hot to shoot the video with us. So we did rent this hall in a left harbor building, carried all lights and cameras on our own up to the third floor and shot the video 24h at 37 Fahrenheit, haha. It was team work and it turned out very well. For "Bleed" we shot again for hours at 37 Fahreinheit, but with a more experienced team and better equipment. The whole concept behind the video was written by our drummer Frederik Ehmke and was luckily used by the director, who sure developed the story and made it fit. We at SINBREED are very much into doing everything on our own, like logo, cover-concept, website and of course the production / recording of the records itself. KNAC.COM: When Worlds Collide, was a critical success, making many “Best of 2010” lists; did this impact your thinking while preparing for Shadows? LAURIN: It did. I personally, having written WWC in total, gave it a lot of thought and I had some serious problems facing this situation. But since I welcomed the other guys since the first writing process to contribute their ideas and songs, it helped to share the accountability. This may seem a little anxious, maybe, but I would have been a total fool to not welcome the others who themselves are experienced songwriters and know what they do. So with me, still writing most of the songs and taking over the procuction once again, I was able to focus on putting all the ideas together and from a record that will feature all SINBREED trademarks and still does grow. In my opinion we succeeded. KNAC.COM: There was a four-year break between your debut and Shadows; did that feel like this was the right length of time, or did it simply take this long for everything to come together properly? LAURIN: Yes, there were things going on, like playing ProgPower USA, welcoming Marcus to the band and sigining with a new record label. Yet nowadays for a band with only one album out this timeframe can easily be the end. But here we are, and we are very thankful that the interest in the band is still huge. We won’t take this for granted so the next record will get released way earlier than four years, haha. KNAC.COM: Describe the writing process for Shadows. LAURIN: Like I mentioned earlier, Shadows is the result of all band members writing songs. "Reborn" for example came out of the rehersals for the ProgPower USA show. So this is really a five guys in one room situation, what I like. The other songs base on ideas from one of us and got delevoped together. Shadows is team work, which was a lot of fun and a opposite to WWC. KNAC.COM: Marcus Siepen of BLIND GUARDIAN joined as co-lead guitarist for Shadows; how did he become involved, and what were his impacts on the writing process and sound of SINBREED? LAURIN: With a second guitarist there was no longer a need for keyboards so we removed them from our sound. I believe this helped to underline the more aggressive approach of Shadows. Marcus came up with two very cool songs, "Leaving The Road" and "Black Death", which show the different aspects of our sound. He obviously got involved through Frederik. When we were looking for a second guitarist after the release of WWC he was the first one to ask. After a few live gigs we asked him to become permanent member and fortunately he joined right away! KNAC.COM: "T. Noller" has numerous lyric writing credits on both CDs. What is his/her relationship with you as a collaborator? LAURIN: His name is Thomas and he is a good friend of mine. I already worked with him for WWC. Thomas is really good at coming up with ideas and lyric structures for songs and he helps us to bring some fresh ideas to a metal song. You know we do not want to sing “only“ about the typical themes like fantsty or e.g. war. We are proud to dive into more complex material like Orwell's 1984 or the impact of pest in medieval times. KNAC.COM: You produced the first CD yourself in partnership with executive producer Emil Westerdahl. On Shadows, you have the sole production credit. Personally, I think that often the band leader is the best person to be in the producer's chair - but it can be challenging to stay fresh and maintain perspective. What was your experience as producer of Shadows? LAURIN: I totally agree. The production of WWC and Shadows was realized by me and as you mentioned, that helped to transport my vision of our sound. Once again, WWC and Shadows are very different because I now had to take care of songs that e.g. Alex or Frederik wrote. I personally do not have an ego, which is not very common for a lead guitarist and band leader, haha. But, with all members trusting me here, I also have the last word when it comes to desicions. A band needs such a guy. So when producing, my own guitar work has the same quality standard that fits for the other guys, too. It was challenging, since it is tough to tell 50% of BLIND GUARDIAN what they should do, hahaha, but it was all right at the end. And, no doubt, I also learn from Marcus or Frederik and I am in dialogue with all members. We are very happy with the result. 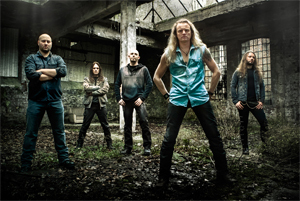 KNAC.COM: Markus Teske has been involved with some other noted bands. How did you end up working with him and how did his mixing influence the overall sound of Shadows? LAURIN: Markus is right around the corner from where I live and it was really fun when I realized that the guy who is responsible for so many records I already owned in my collection lives right next door, haha. We worked with him for WWC and there was no doubt to ask him for Shadows, too. For Shadows we focused for the whole result on the mix. We decided to record everything on our own as a band and then spend more time on mixing. We did nearly 10 mixes of the record and all band members were able to check them out and give opinions. I spend lots of time with Markus to change the sound but after all this - Shadows sounds the way it does and it does sound brutal! KNAC.COM: The response to Shadows seems to be very positive. How do you feel it compares with When Worlds Collide and did you accomplish what you set out to do with your sophomore release? LAURIN: Absolutely. From production to songwriting to establish SINBREED even more as a band - I could not be happier. KNAC.COM: What prompted the switch from Ulterium Records? What is your opinion of the partnership with AFM Records thus far? LAURIN: To work with AFM was the logic next step. They have great bands in their roster, and they believe in Power Metal. So far the collaboration is very efficient and I believe SINBREED will conquer the next step. KNAC.COM: What are your thoughts on the current state of the music industry in general and metal in particular - where band expenses continue to rise while sales and profits decline? LAURIN: Yes, unfortunately. Even for a band like SINBREED - I am aware that we are still new to the scene – it comes all down to economics. We decided to record Shadows on our own so that we can spend more of the budget for a longer mixing process. Imagine how the record would sound with 5 guys sitting all together in the studio for 6 months, recording, mixing and master it in one facility? I believe the future is not that bright for the music scene in general, but for the metal scene I have big hope. Shadows got released as vinyl and is highly acclaimed. Metal bands sell their CDs and there will always be fans that support their band idolatrous. I am very thankful that SINBREED can also count on such fans so that we have the chance to continue release records. KNAC.COM: What's next for SINBREED? Any tour dates/gigs in the works? LAURIN: We are currently in the make of some live shows during Fall 2014 and - pretty sure - we focus on the next release. As I promised before, it won't take four more years for the follow up, haha. KNAC.COM: Please add anything else that you would like to share with KNAC.COM readers. LAURIN: I thank all the KNAC.COM readers for the interest in SINBREED and if you haven’t got the chance to check out Shadows – if you are into fast and heavy power metal with high and soaring vocals I assure you: you won’t be disappointed. All the best and stay heavy! Pick up your copy of Shadows in the KNAC.COM More Store right HERE. A review of the Shadows CD can be found HERE.